Yes, I know it's only the beginning of August but I was wandering around the shops yesterday lunchtime and everywhere I went they'd started to bring their Autumn ranges into the stores. I have to say, I loved a lot of what I saw; I'm definitely more of an Autumn/Winter girl than a Spring/Summer one. I actually can't wait to get my opaque tights out and start layering up again. Sorry, that's just the way I am. I feel far more comfortable in Autumn/Winter clothing and I do in thin Summer dresses and the like. Anyway, what struck me most was the lovely colour palette; dark, bottle greens, ochre/mustard yellows and orangey rusts. Gorgeous! It all looked very 1970's to me, in colour if nothing else. I thought I'd share with you some of my favourite pieces from my quick look yesterday, and maybe some suggestions for recreating the looks yourself. I went into Marks and Spencer first. I always look in there, they can be a bit hit and miss, but generally the Autograph range is good and so is the Limited Collection. However yesterday I think several of the items I liked were from the Per Una range, which is one I rarely look at as it normally features embellished knits and "overdesigned" garments as far as I'm concerned. 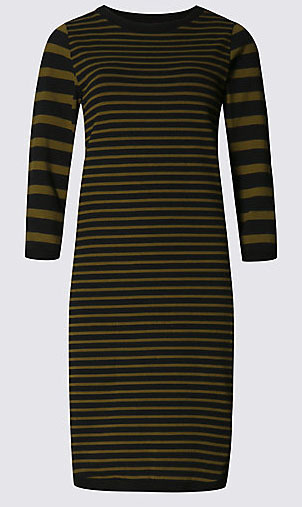 This Ponte tunic dress looked pretty nice, easy to wear, comfortable but still halfway smart. I like dresses like this for work as I often spend several hours in the car getting to where I'm going, and wearing jersey or Ponte fabrics means I reach my destination largely crease free. I'd wear this to work and at weekends, with opaque tights and ankle boots. You could easily use a simple shift dress pattern to recreate this, the trick is finding two striped fabrics in matching colours but with differing width stripes. That could be a bit difficult, so you could always do a stripe for the body and plain sleeves, or vice versa if that was more your thing. 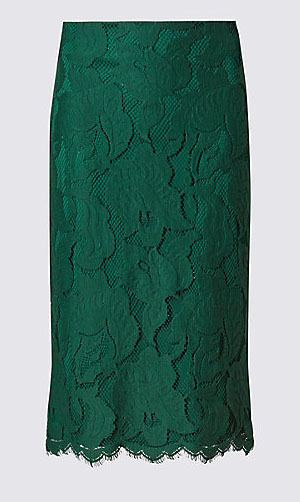 I loved this green lace skirt, but am not really sure where I'd wear it. For me this would probably be a special occasion type garment, although I do love simple lace skirts with a chunky sweater and (again) opaque tights. There are any number of simple skirt patterns that you could use for this - I would use my skirt block - either straight or A-line, and White Tree Fabrics have a lovely selection of laces that would work a treat for this. 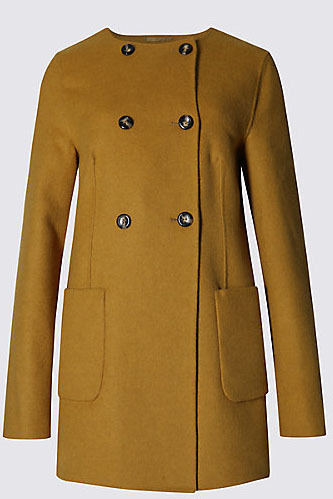 This coat is the perfect style and length for me, and I adore the colour. I'm not a fan of coats with collars, and the length of this would make it an ideal coat to wear in the car - see above, I spend a LOT of time in my car. Burdastyle Dress Coat 09/2012 #102 is a pretty good match for this, although it has raglan sleeves and inseam pockets rather than patch pockets. Patch pockets would be easy to add though. I'm sure a more thorough search would bring up something even closer. 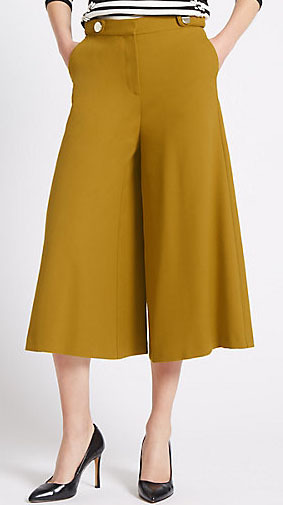 I really liked these ochre/mustard culottes as well. I think I'd have a go at drafting my own, once I've finished my trouser block. I must get that back out, I started it months ago! Then I moved on to Next. Again, I generally have a look in here but I'm often disappointed. Most of their clothes seem very identifiable as being from Next which some people might like... I don't. But it's a pretty good place to get ideas and they do have some nice pieces. There were a few things I fell in love with, the first being this skirt. I love, love, love the fabric. 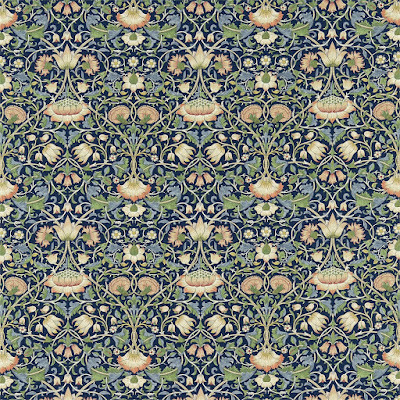 To me its very Art Nouveau / William Morris. 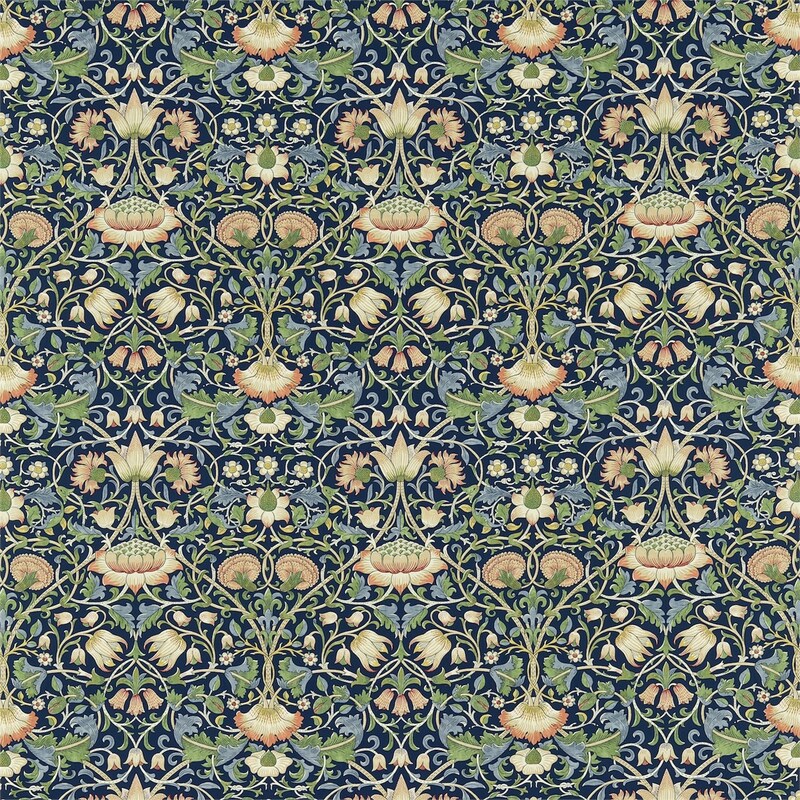 Again, its a simple shape which would be easy to recreate, and if you wanted to make your own there are plenty of furnishing fabrics around with this type of print. You could even go the whole way and treat yourself to some Morris & Co fabric, although at £59 a metre I'm not sure I would. I know this is a sewing blog, but I can see myself just buying this skirt. 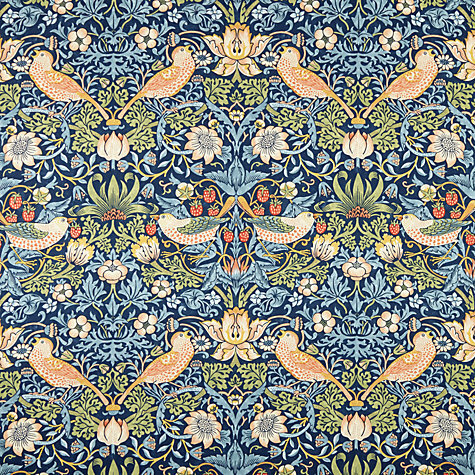 Classic William Morris "Strawberry Thief" design. 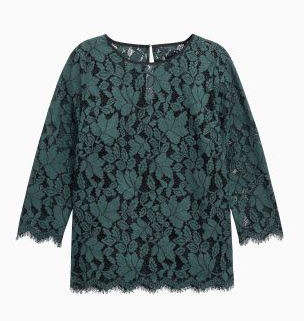 This lace top would look lovely with the ochre culottes from M&S above, or with a black pencil skirt or trousers; maybe even with the skirt above. Again, White Tree Fabrics would be an excellent place to look for lace to recreate this. Apparently they have over 700 lace fabrics on their website, so I'm sure you'd find something you loved. I then spotted this dress and again I love everything about it. The cut, the colour, they really are me! I'm definitely going to recreate this; I will probably use Alison Glass's Woven Essentials pattern (which I have recently made as a sample for Fabric HQ and am yet to blog about) and draft some flutter sleeves. 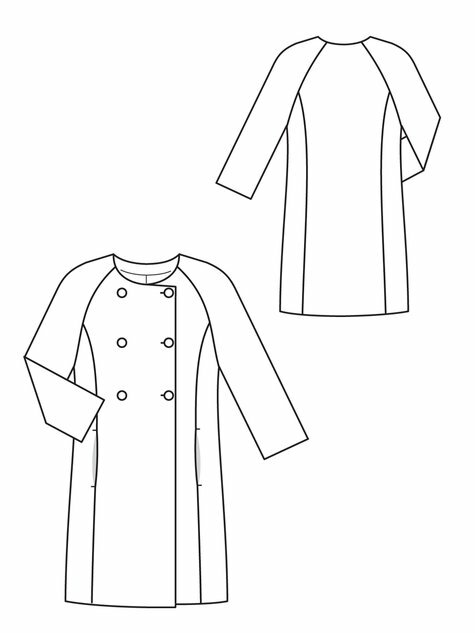 This pattern is great by the way - you get a basic shift dress with a slightly A-line skirt, then additional pattern pieces for a gathered skirt, longer sleeves, a skirt and a tunic top. 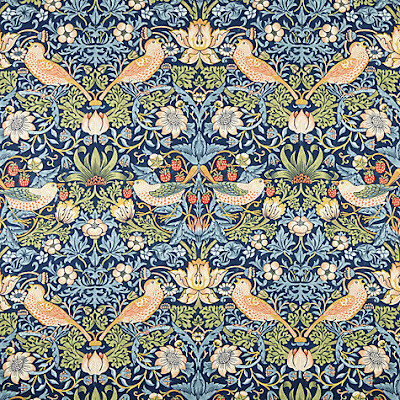 Although the pattern is for wovens, I'd make this in a Ponte fabric. Minerva Crafts have some in a Forest Green which looks as if it's an almost exact match. Finally, another dress and not a style I'd normally go for. To me though, this looks REALLY Vivienne Westwood and you should know by now how much I love her designs. I think you could use the (sadly now out of print) DKNY Vogue 1488 as a starting point for this. I'm so glad I bought this before it was discontinued. Change the neckline to a V-neck and lengthen the sleeves and you're pretty much there! I'll be searching for some large plaid fabric later! I hope you've enjoyed my virtual shopping spree. Have you started thinking about Autumn projects yet or is it far too early for you? I really like the colours but not sure about the styles for me. Those lovely long lines don't work so well on short & fat! I'm not so tall and skinny myself Fran! I am extra excited for this fall season. I love the colors, shapes and styles that are in right now. Have you got similar styles/colours coming up in the US? I do think it's quite similar. Volume is definitely in as is a bit of "mod" look! 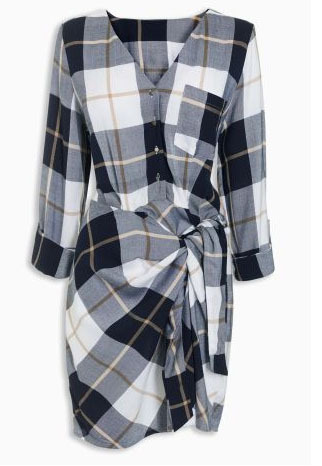 I was thinking of sewing a large plaid dress using some of the fabric I got from the USA: I might have to steal your idea of using the DKNY pattern, which I also have! 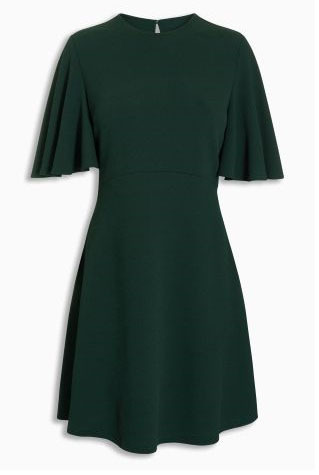 I love the items you have been eyeing, the dark green is one of my favorite colours I see popping u for fall. And while it's still summer, it seems the second August hits everyone is talking about September! That dark green is wonderful isn't it? I bet it looks lovely on you with your colouring. I love all your choices! Funny - as soon as I saw that plaid dress, I thought: That's a Sam dress!! I like what you have done here. I think it's great to get inspiration from the high street (and everywhere else!). 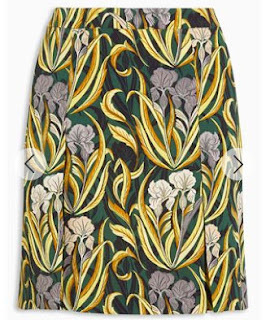 I like the William Morris skirt, and what is more I love it with the dark green lace top. I love mixing and matching pattern and texture. And thanks for the lace supplier. I actually ordered the William Morris skirt from Next. It's nice, much shorter than I would normally wear, but I think it will be OK in the winter with opaque tights. White Tree Fabrics are brilliant for lace!